How many times has this happened to you in Windows? You are installing a program and you want it to install in a particular folder on your D, E, F or G drive instead of C: where you have installed your operating system and other system files. So you wait for that particular window/dialog of the installer to prompt with a field indicating where the program will be installed and beside it is a "Browse" button that helps you change that location. But instead of showing you this screen (most programs do and some do if you click the Custom installation option) some programs directly install on your C: drive without any warning. Now here's a trick you can do so that "these" programs will default to a particular drive or folder where you want programs to install if they don't prompt you with that "folder to install" window while installing. Note that you will be making changes to the registry and so do be careful. Take this as a disclaimer in that that playing with the Registry carelessly can screw up your computer and make it un-usable unless you do a fresh install of the O.S. At the same time do not be paranoid about the registry editor. A little care and you will do fine. You simply tweak a registry entry and that will do the trick. To invoke the registy editor or the regedit.exe program and do the tweak follow the steps below. 1. Click Start and from the Start menu click Run. 2. In the Run dialog enter regedit in the Open field and press Enter. 3. The Registry Editor opens. Note: Since there are many CurrentVersion keys in your registry make sure you navigate to the right key as indicated above. The best way to do this is to patiently expand the folders on the left starting with HKEY_LOCAL_MACHINE and then gradually navigating to the CurrentVersion folder. It should look as follows. Now here is an important tip. To ensure that you are at the correct folder look for the name of the folder displayed at the bottom of the registry window. It must display HKEY_LOCAL_MACHINE\SOFTWARE\Microsoft\Windows\CurrentVersion under the folder the registry is installed. 5. 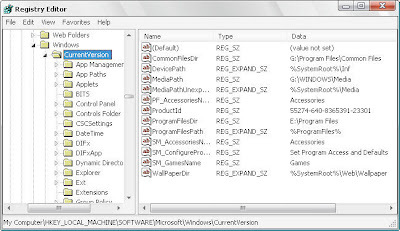 The ProgramFilesDir key displays the current folder where new programs will be installed. In this case E:\Program Files is displayed. 6. To change this folder to the one you wish to designate as the default folder where new programs are to be installed right click it and from the menu select Modify. 7. In the dialog that opens replace the folder name in the Value Data: field. Make sure the folder exists. 8. Click OK and you are done. 9. Exit the Registry Editor program. Now even if you forget to change the directory to the folder of your choice while installing new programs will only install in the default folder you have changed to. By the way that was also a sample of Technical Writing. A useful tip, Subhash! Technical writing... must be having a lot of patience!! BTW, had a chance to see Roopa and Anand, along with G Venugopal, Ravi Shankar and Vrinda (associated with kairali tv). They were performing here (in Dubai, I'm here for a project) last weekend. It was basically a felicitation ceremony for M G Radhakrishnan by an organization here. There was a small concert by Omanakutty teacher as well, which was really good, barring some sound system problems. My relatives were in touch with Roopa too when she was there in Dubai. I think they might have also been to this concert. As for Tech.writing, that's what I do for a living. Yes it is sometimes boring as hell. But the knack is to make it interesting by finding out the best way you can explain something/anything to the layman.